Kiwa tyleri - the Antarctic Yeti Crab, named for Southampton polar biologist Professor Paul Tyler. Two species of marine life with direct links to the University of Southampton are highlighted as part of celebrations marking the wondrous discoveries made during the first decade of the World Register of Marine Species (WoRMS). 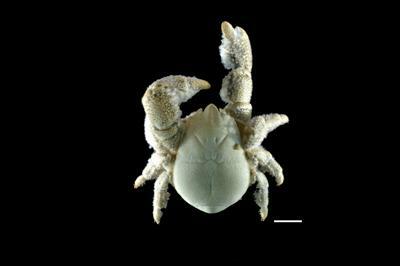 The Antarctic Yeti Crab Kiwa tyleri - named for world-renowned British deep-sea and polar biologist Professor Paul Tyler from the University of Southampton, features on a list of the top 10 astounding marine species of the decade (2007-2017). Kiwa tyleri is the first species of Yeti Crab discovered in hydrothermal vent systems of the East Scotia Ridge in the Southern Ocean, Antarctica in 2010. Also known as the ‘Hoff’ crab – so nicknamed after actor David Hasselhoff because of its hairy chest – the species is the only member of its genus found outside the Pacific Ocean. The crabs were found living in large colonies of around 600 per square metre at depths of around 2.5km in close proximity to fluid emanating from hydrothermal vents. Also making the top 10 is the scaly-foot marine snail, Chrysomallon squamiferum a new genus and species of gastropod which inhabits the hydrothermal vents of the Southwest Indian Ridge of the Indian Ocean identified by an international team of researchers including Dr Jon Copley, Associate Professor in Ocean Exploration & Public Engagement at the University of Southampton. Chrysomallon squamiferum is another deep sea inhabitant that also thrives on the edge of hydrothermal vents at around 2.8km beneath the Indian Ocean. The ‘foot’ of this species, first encountered in 2001 but christened in 2015, displays hundreds of armour-like hardened tags called sclerites – fleshy in the centre and hard on the exterior due to a later of protein secreted as part of shell formation covered by a layer of iron sulphide that gives it a black metallic appearance. Since the WoRMS was founded in 2007, over 21,500 marine species new to science have been described and added by researchers around the world. All editors of WoRMS were given the opportunity to nominate their favourite marine species from both the last year (2017) and the previous decade (2007-2017) resulting in a ‘top 10’ for each. Kiwa tyleri is the first species of Yeti Crab discovered in hydrothermal vent systems of the East Scotia Ridge in the Southern Ocean, Antarctica in 2010. 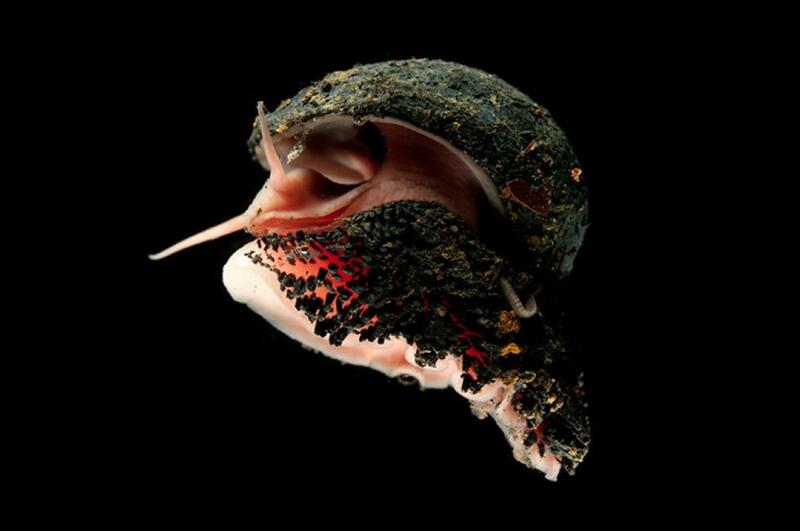 The scaly-foot marine snail, Chrysomallon squamiferum, is a new genus and species of gastropod which inhabits the hydrothermal vents of the Southwest Indian Ridge of the Indian Ocean.